We have enjoyed our three days here at Green Turtle Bay. It is a great marina with wonderful facilities and restaurants. This morning we say goodbye to the multitude of looper boats still here. Most will also be heading south in the next few days. Today is a great day for cruising and we are anxious to get underway. The light fog begins to lift as the sun peeks above the horizon. Once in Barkley Lake we soon make a starboard turn into the Barkley Canal. This short man-made waterway brings us into Kentucky Lake on the Tennessee River. Kentucky Lake has over 2380 miles of shoreline and is one of the largest man-made bodies of water in the world. 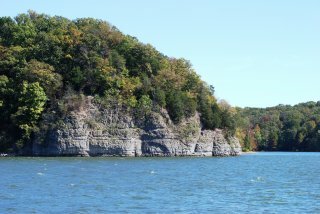 The next 40 miles of the Kentucky shoreline is know as the Land Between the Lakes (LBL). Created by President Kennedy in 1963, this area offers many secluded coves for anchoring. It is difficult to choose from the multitude of anchorages. We travel only a short distance to one of the coves known as Panther Bay. After carefully working our way up the cove, being cautious of the depths, we drop the hook for the evening. It is a nice secluded spot protected from the winds by a high rocky bluff. This area is popular with the fishermen as we watch them come and go all day. Just beyond our anchorage is some sort of buoy which is marked as a fish attractor on our charts. Wonder what it is? A great dinner of steaks on the grill finishes off another good day. It is a cold grey day as we pull anchor and leave our anchorage at Panther Bay. This doesn’t seem to deter the many fishermen out in their bass boats. As we approach the Big Sandy River junction, we scan the horizon for wildlife. 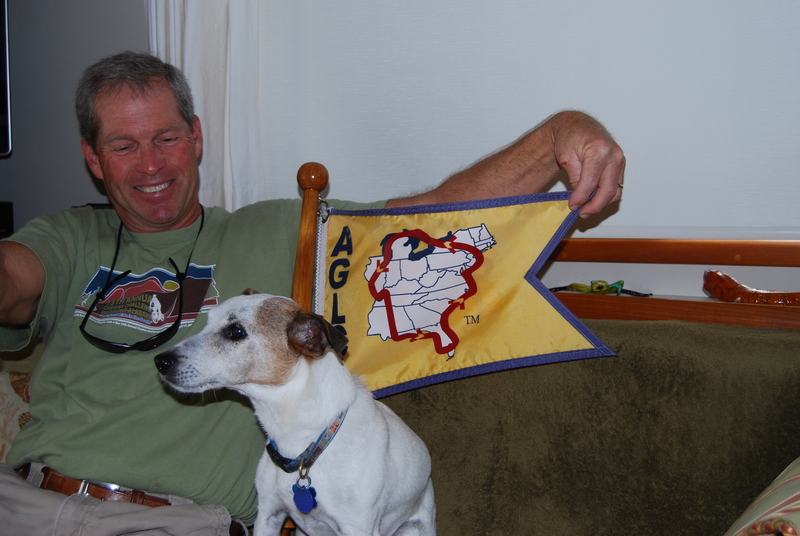 This area is a national wildlife refuge and the winter home to over 75 bald eagles. 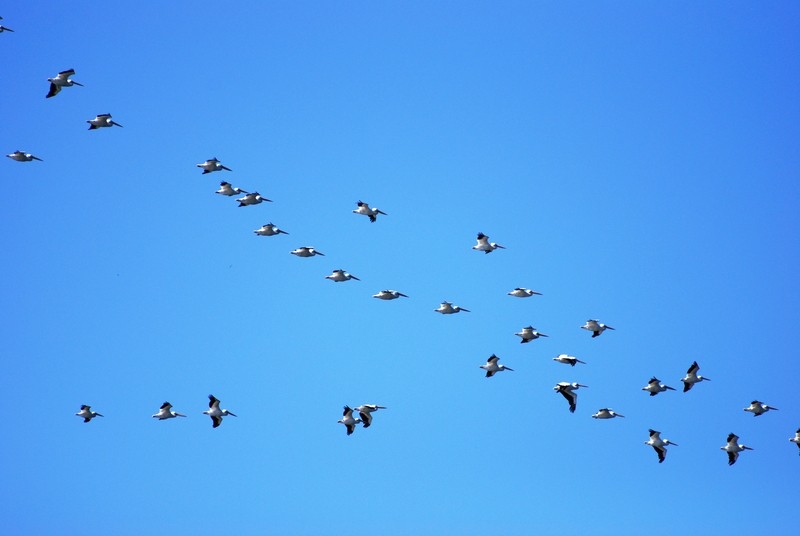 More than 200,000 ducks and 25,000 Canada geese migrate here each fall. 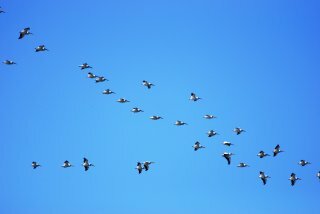 Today we see several flocks of white pelicans as they fly overhead. 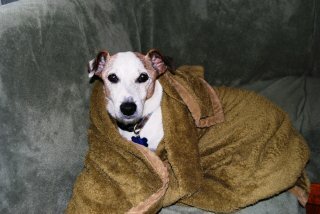 It is cold and breezy out this morning but the sun soon warms things up nicely. 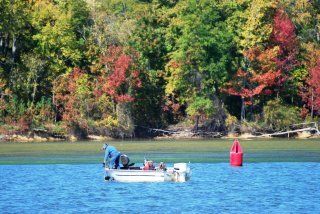 We enjoy the fall day on the water with the trees just starting to show their autumn colors. We arrive at our stop for the evening mid afternoon. Following the well marked but narrow channel into Trace Creek there we see another looper just ahead. 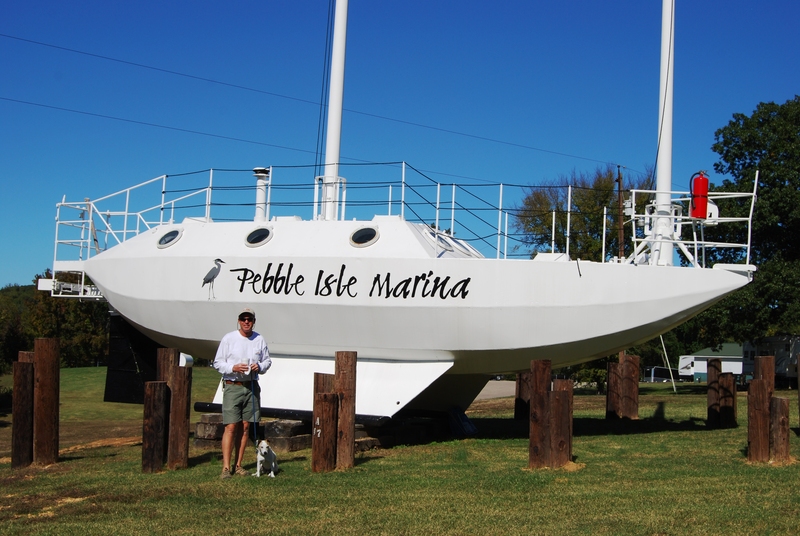 We are soon docked at the popular looper stop of Pebble Isle Marina. 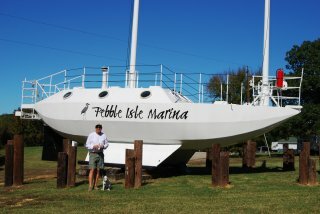 It is a family run marina and they have a great reputation among the boaters for their warm southern hospitality. This afternoon we enjoy a mile hike to the Johnsonville State Park. This area and the town of Johnsonville holds much Civil War history. Johnsonville was eventually flooded by TVA in the 1940’s and now exists in name only. We have a great dinner of catfish this evening at the small floating marina restaurant. The restaurant is full of other loopers, and we all enjoy great conversations with each other. There is no rush this morning as the marina provides complementary homemade cinnamon rolls and hot coffee each morning at 8:30 AM for the boaters. Yes, this is one of the reasons we stopped here! We enjoy these fresh baked rolls while chatting with the crew’s of Limelight and Watermusic who are also loopers. This is a great part of the looper experience. Once out on the Tennessee, we have another easy day of cruising. The Tennessee River is a much kinder river than the Ohio and Mississippi. The channel is wide and deep with very few barges to negotiate. Just as we think life is good, our navigation computer starts beeping at us. For both navigation and our auto pilot, we use a computer based program called Nobeltec. It just crashed. While troubleshooting the problem, we switch to our Furuno system which is a backup navigational program. We are able to restart the Nobeltec but it continues to crash on us over the next few hours. This is really strange as it has run perfectly for the last six years. Luckily it continues to run while we enter our anchorage for the evening at Beech Island just before sunset. We pull behind this wide deep island and drop the hook in 20 feet of water. After several phone calls, we email some of the program files to the Nobeltec support team in Seattle, WA. Hopefully they will be able to diagnose the problem. 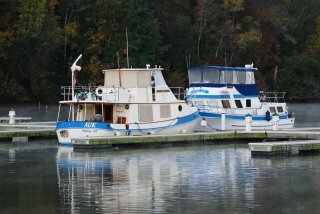 We are the only boat at anchor here and enjoy a quiet evening. “ Its primary role is transporting components for the Boeing Atlas V and Delta rockets from the manufacturer, located in Decatur, Alabama, to launch facilities at Cape Canaveral Air Force Station in Florida and Vandenberg Air Force Base in California. The ship is designed for shallow inland waterways as well as the open ocean and is capable of carrying up to three 160-foot (49 m) long Delta IV Common Booster Cores. Some cargos carried by the Mariner were formerly transported by Russian transport aircraft from the manufacturer to the launch site. Completed rocket stages and other components are transported by truck approximately 1.5 miles (2.4 km) from the Decatur Boeing manufacturing facility to the dock on the Tennessee River and rolled directly onto the ship. From Decatur, Delta Mariner uses two routes to the Gulf of Mexico. The first route takes the vessel downstream on the Tennessee River to the Tennessee–Tombigbee Waterway, south to the Tombigbee River, and into Mobile Bay and the Gulf, a distance of about 550 miles (890 km). 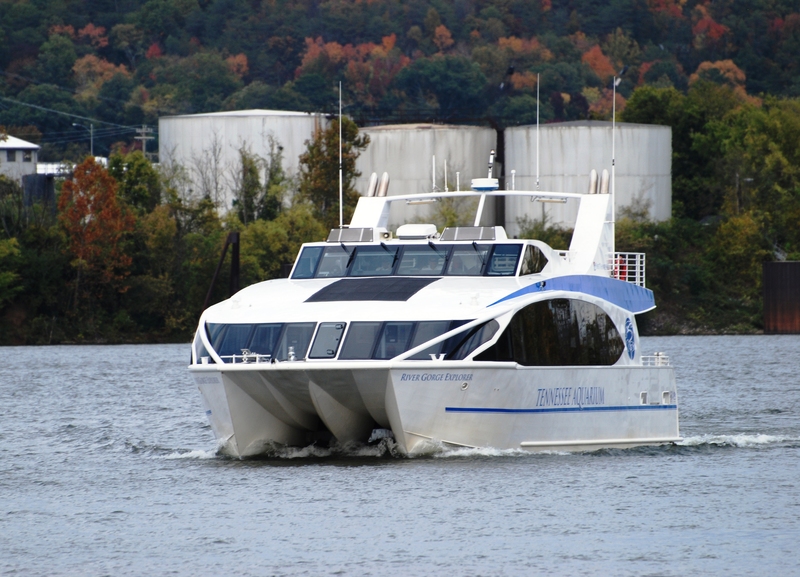 The current route takes the Tennessee and Ohio Rivers downstream, south on the Mississippi River, and into the Gulf, more than 1,000 miles (1,600 km). From the Boeing plant, Delta Mariner may travel around the Florida peninsula to Cape Canaveral, a 2,100-mile (3,400 km) trip; or through the Panama Canal to Vandenberg, a three week journey which covers around 5,000 miles (8,000 km). On August 7, 2001, Delta Mariner ran aground on a sandbar in the Tennessee River during its initial docking attempt at Decatur. This was Mariner‘s first arrival at the dock since its launch. The vessel was freed by a tugboat about an hour after the incident. On January 26, 2012, around 20:10 CST, Delta Mariner struck the Eggner Ferry Bridge, which crosses Kentucky Lake near Murray and Cadiz, Kentucky. There were no injuries on the ship or bridge, and, while Delta Mariner was “not severely damaged” and the cargo of Atlas and Centaur stages was undamaged, the collision destroyed a 300-foot (91 m) section of the bridge. According to Foss Maritime’s spokesman, this was on the regular route taken by the vessel. It is not known exactly what caused the incident, but U.S. Coast Guard officials state the vessel was operating in a recreational channel at the time of the collision, rather than the shipping channel which offers greater bridge clearance. Foss representatives maintain that the bridge’s channel navigation lights were not operational, though Kentucky Transportation Cabinet Secretary Mike Hancock stated this should not have been a significant factor in the incident and KYTC spokesman Keith Todd said he believes most of the lights were functioning at the time. 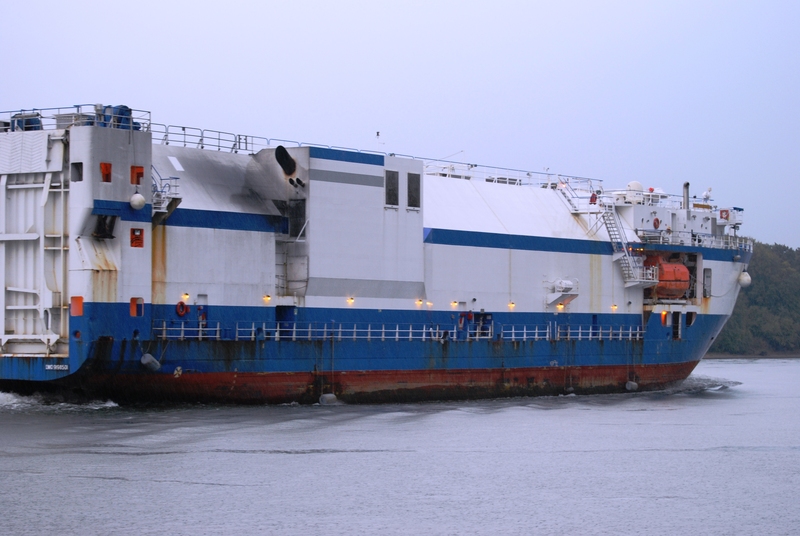 The ship has remained anchored at the bridge since the incident took place so that salvage plans could be developed and equipment moved into place. Salvage operations are being led by T&T Bisso of Houston, with assistance from local and regional companies. During February 4–5, divers worked to remove debris which caught underwater on the Mariner‘s hull. Once this has been removed and the vessel regains movement, it will be relocated downriver to a safe harbor on Kentucky Lake where cranes will remove the remaining debris from the forward hull. The Coast Guard estimates this removal may take several weeks.” Glad we read about the bridge incident after passing the Grand Mariner! We pass quite a few other tows on the water today but the river is wide so they aren’t much of a concern. Nearing the Pickwick Lock, the current picks up and we are now fighting almost a 3 knot current as we waddle upstream. After an hour wait at the lock, we are raised 50 feet into Pickwick Lake. From there it is a short trip to Yellow Creek and our home for the next few days at Grand Harbor Marina. We are now back in Mississippi as Grand Harbor sits at the junction of Tennessee, Alabama, and Mississippi. This is also the beginning of the Tenn-Tom Waterway which is the route boaters follow headed for the Gulf Coast and Florida. Today we have a celebration for Idyll Time, Sebastian, and the birds. They all crossed their wake from 2007, have now completed the loop, and they are official Gold Loopers. We spend two days here at Grand Harbor while waiting o ut some storms and high wind. This gives us a chance to visit Shiloh National Military Park just 20 miles from the marina. 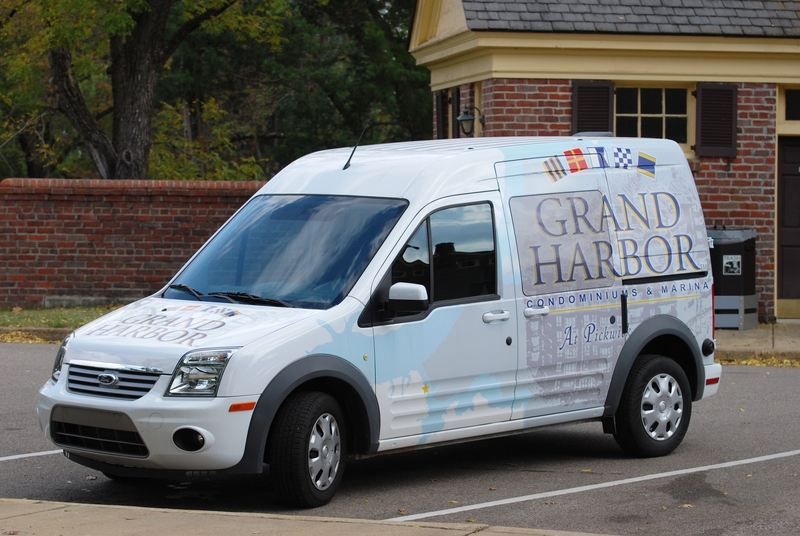 Like many marinas, Grand Harbor offers a courtesy car to boaters. We felt a little strange in this one, a brightly decaled mini-van. People certainly knew where we were from. On our return from Shiloh we discovered another great find of Heggys Catfish Hotel. 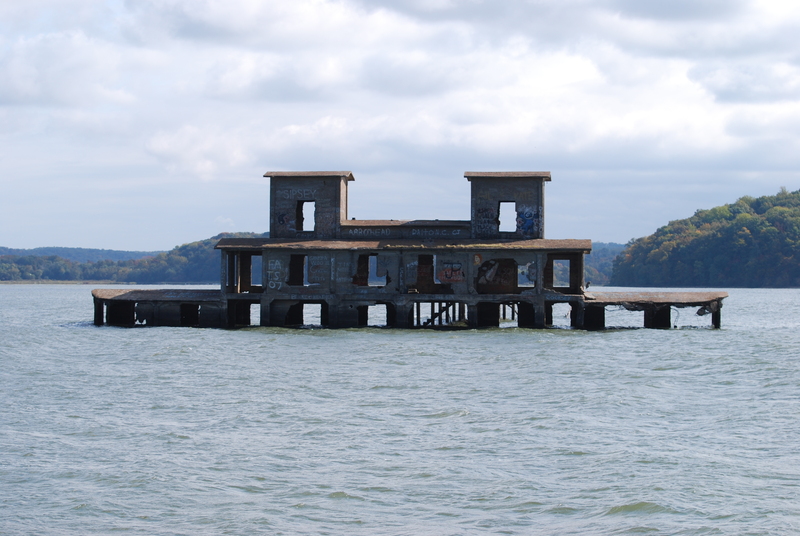 This local landmark is one of the many catfish restaurants along the Tennessee River. 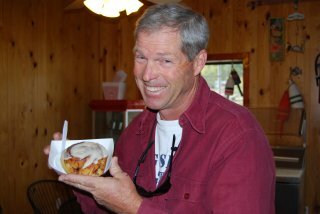 The “all you can eat catfish” had Jeff’s name on it. Here we had a great meal and also a great view of the Tennessee River. We ended our stay at Grand Harbor visiting with several other loopers, one of the couples are traveling the loop in a 24 ft. sailboat. The loop can certainly be done in almost any size boat. Today is another enjoyable but long day on the water. Our first of two locks today is the Wilson lock. This dam, named after President Woodrow Wilson, is the oldest on the river. The original chamber was completed in 1925. 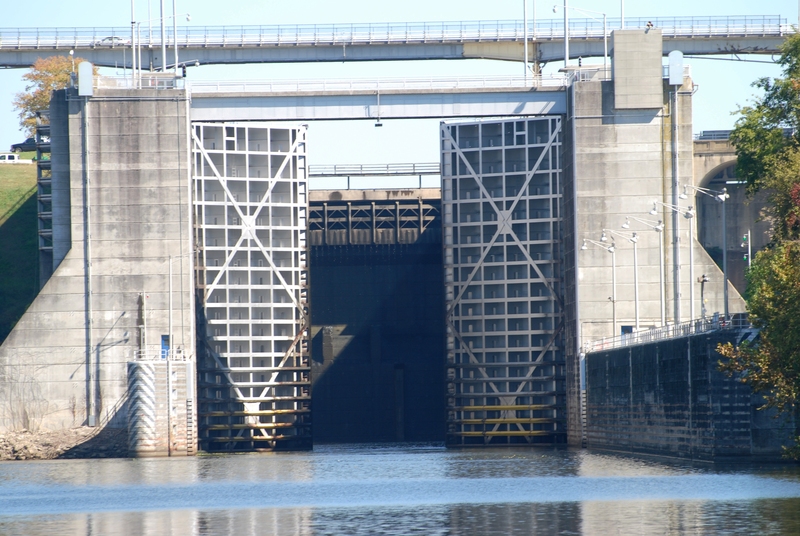 In the 1950’s a new lock was added which at the time was the world’s highest lift lock. It now ranks as the 6th highest in the U.S. with a lift of 96 feet. Boy do we seem small as the massive steel doors close behind us. Leaving the lock, we also leave Pickwick Lake and are now in Lake Wilson. Today our Nobeltec navigation program is crashing again. We had installed an electronic patch sent from Nobeltec to fix the problem while in Grand Harbor. Looks like it didn’t work and we are back on the phone with them. 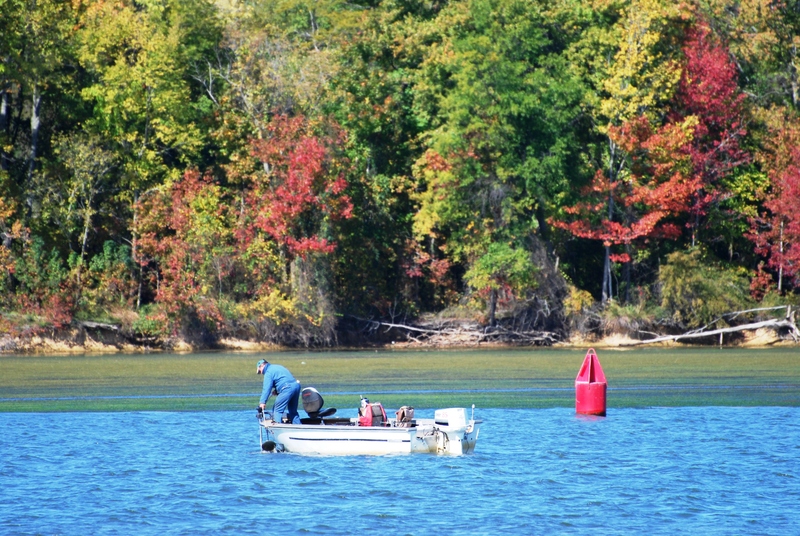 Luckily the TN River is easy to navigate and we do have alternate navigation programs running. After a short wait at Joe Wheeler Lock, we are lifted up into Lake Wheeler. Just a few more miles of travel and we enter Joe Wheeler State Park, a familiar stop for us. We have been here several times as the Great Loop Fall Rendezvous is held here each year. Although mostly empty now, in just a few days the docks will be jammed full of looper boats. Pulling into the docks, we are pleasantly surprised to find Ken and Ellen, aboard the Krogen Manatee AUK, waiting at the slip to grab our lines. We first met them two years ago while exploring Lake Superior. What a small world it is to see them again here on the TN River. We enjoy a nice evening on the back deck catching up with them and hearing about their travels on the TN River. 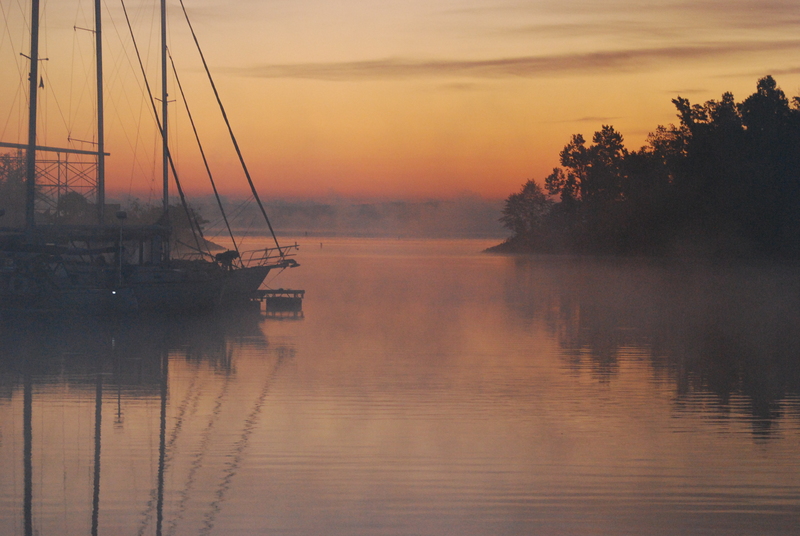 We pull away from the docks just as the sun starts to burn off some of the early morning fog. It is another beautiful day on the TN River. 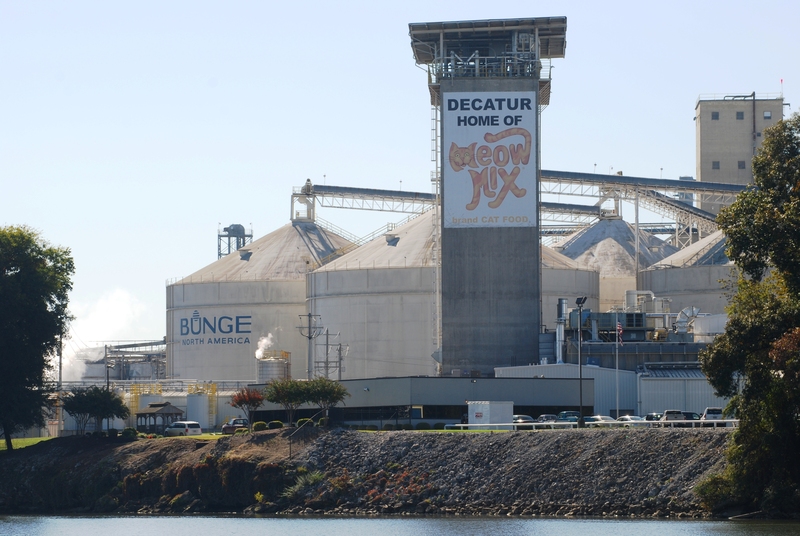 Our trip this morning takes us through a five mile stretch of industrial area to the small town of Decatur. Our Nobeltec program is still crashing regularly with no solution in sight. Fortunately we have no commercial boat traffic to deal with. This afternoon the river returns to a more remote area as we pass through the Wheeler National Wildlife Refuge. Thousands of Canadian geese and ducks spend their winters here. Reaching the Guntersville lock, we see our first tow of the day and he is a big one. 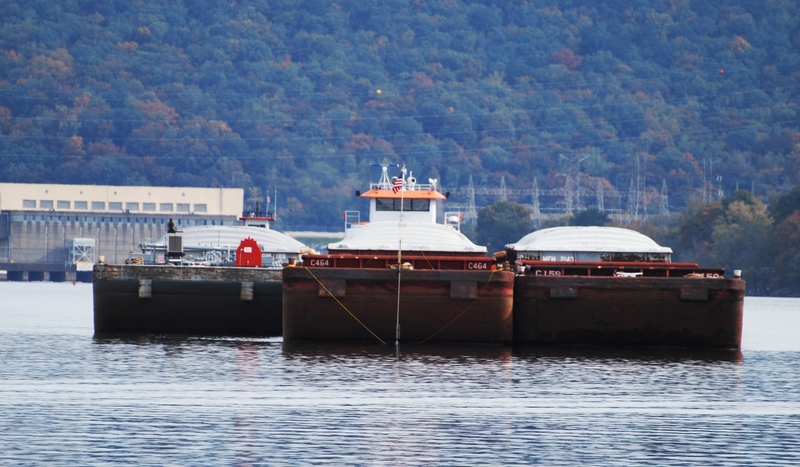 This guy is 4 barges wide and five barges long, just like those we encountered on the Mississippi River. After calling him on the VHF, we are told to do a “One Whistle” pass and we both pass port to port with only a few feet to spare. Reaching the lock, we see several looper boats coming out as they returning from Chattanooga and heading to the rendezvous at Joe Wheeler. After a quick hello, we enter the Guntersville chamber and soon have our line secured around the floating bollard. This is one of the older locks, being built in 1939. From here we have only a short trip to the Guntersville Yacht Club. 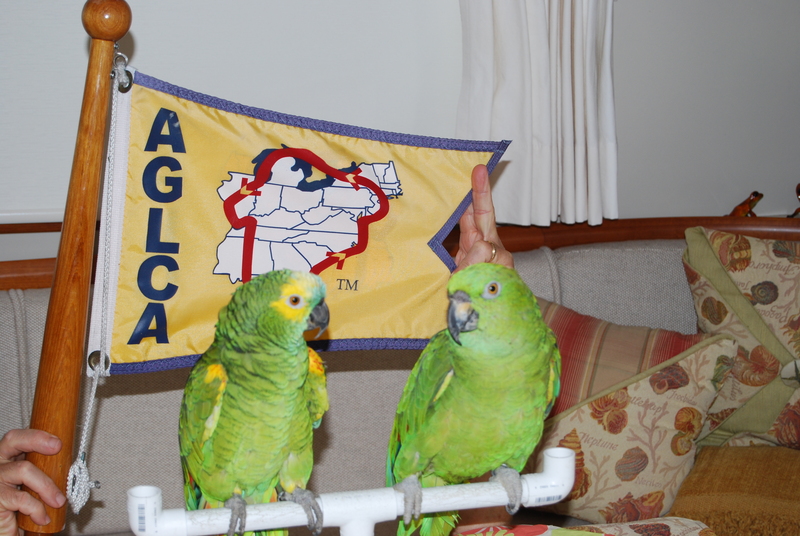 Being members of the Chattanooga Yacht Club, we are given complementary dockage here as our club does the same for their members. After another long day on the water, we are to bed early. Just after leaving Guntersville, we were engulfed in fog. It was pea soup for several miles. With the fog horn armed, we are constantly scanning the radar for any traffic. 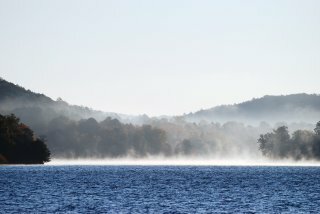 As the day warms up, the fog burns off and we have another pleasant day on the river. For some strange reason, our Nobeltec program is now running perfectly. No crashes at all today. It appears we have moved into a new chart zone that is now error free. We will keep our fingers crossed. Our trip today is uneventful. With no locks to navigate, we are able to make good time and reach our anchorage mid-afternoon. Never having been in this anchorage, we enter slowly being cautious of dead heads lurking just under the surface. The anchorage is wide and deep and we find an 18 foot area to drop the hook. We are just a few miles downstream of the Nickajack Lock and the current here is about two knots. This helps keep us pointed in one direction and we don’t have to worry about the fat girl wandering around during the night. It is a peaceful spot and we enjoy our last evening at anchor. Today is a special day. We are on our way home to Chattanooga, TN. After leaving here in Jan. 2007, we have now traveled over 15,000 miles and today we are coming full circle back to our home in Chattanooga. From our anchorage, we have a short four mile trip to Nickajack lock. While being lifted the 40 feet, I hear someone from above saying hello. It turns out to be a Colonel from the Army Corp of Engineers who is visiting the locks. After learning of our trip and impending homecoming, he presents us with an authentic U.S. Army Corp medallion. This is such a special ending to our great loop journey. Outside the lock, we are now traveling in Nickajack Lake. This next section of the river is know as “The Grand Canyon of the Tennessee”. 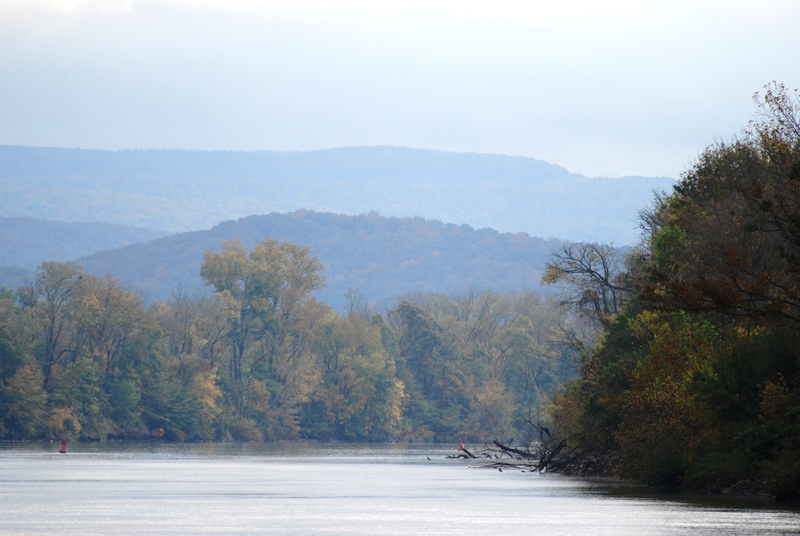 The next 30 miles offers some of the most stunning scenery the Tennessee River has to offer. We wind our way through the Cumberland Mountains with many twists and turns. 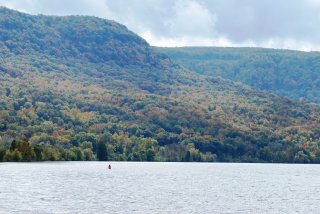 The surrounding mountains drop steeply to the waters edge. 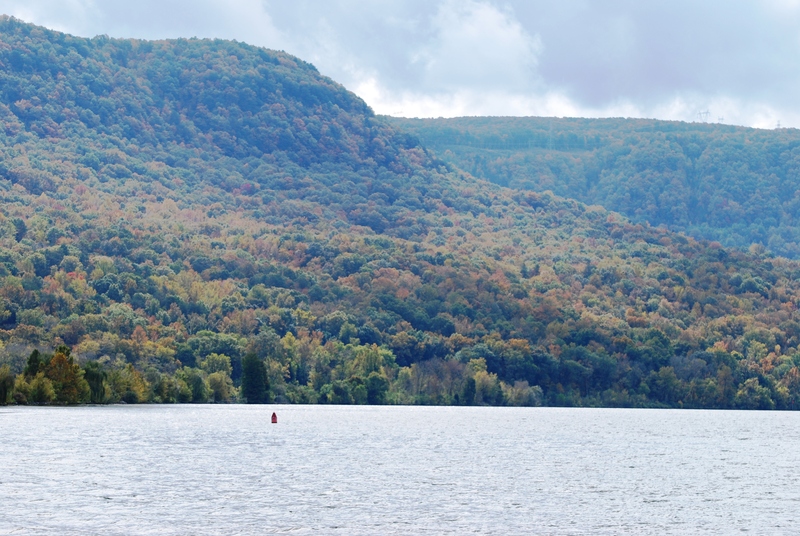 With the fall foliage just emerging, the scenery is a welcome and spectacular sight. Nearing Chattanooga, we see the Tennessee Aquarium’s tour boat just ahead. 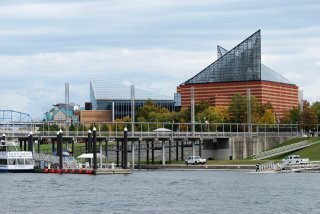 We follow the River Gorge Explorer into downtown Chattanooga. For the next few days we are staying at the Bluff View docks in the heart of downtown . Becoming tourists in our own city, we feel a little strange walking around the downtown and spending a few nights at the city docks before returning to our home. 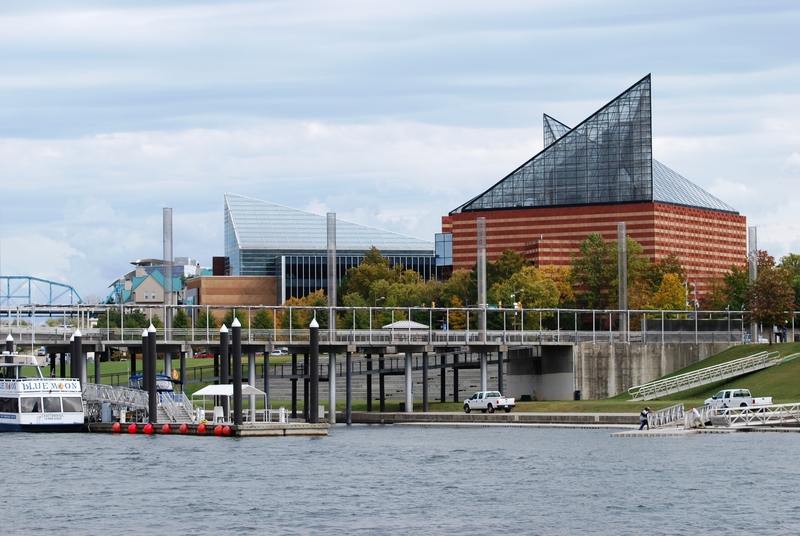 The downtown docks are a great location just below the TN Aquarium. Our nephew, Stormy, joins us for our final two evenings. 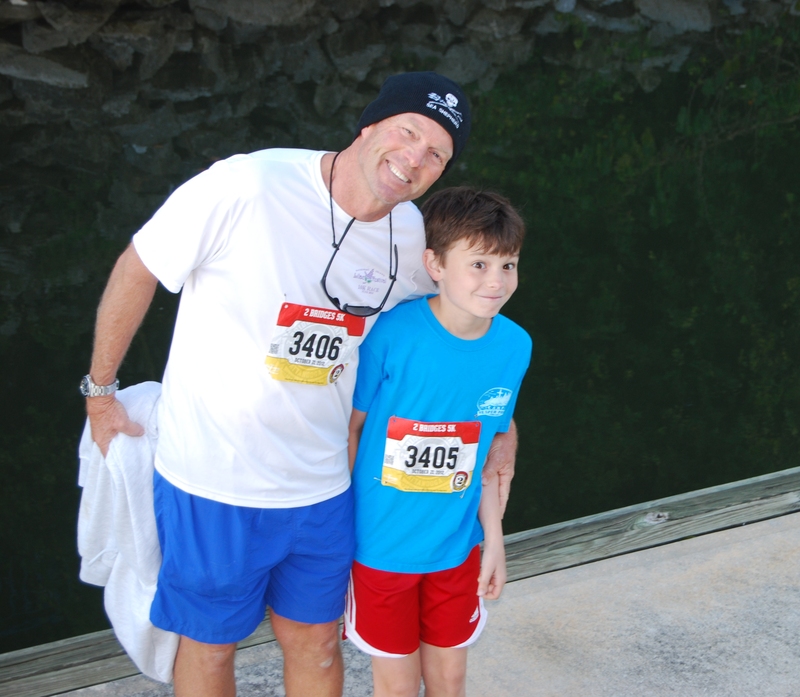 Jeff and Stormy end our trip by running together in the 2 Bridges 5K run. It is finally time to return IT to her home at the Chattanooga Yacht Club. A fifteen mile cruise with one more lock thrown in for good measure, and Idyll Time returns to her boat house which she calls home. She deserves some much needed rest and tender care. 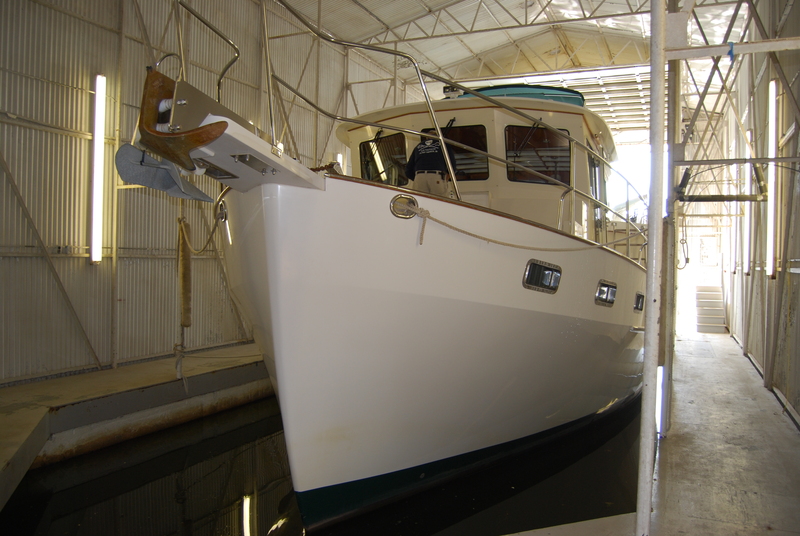 We have lots of boat projects to keep us busy over the winter. 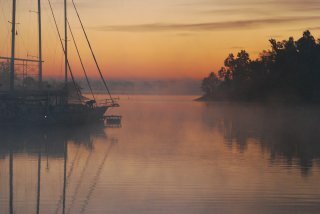 We look forward to cruising our home waters of the Tennessee River over the next year and exploring it’s 652 miles of navigational waters. This entry was posted on October 28, 2012 at 4:10 pm. You can follow any responses to this entry through the RSS 2.0 feed. You can leave a response, or trackback from your own site. 1 Response to "The Great Rivers Part 3: Heading Home"
Congratulations! to all and Welcome Home!! !